The next one is best viewed full-sized on a computer screen. 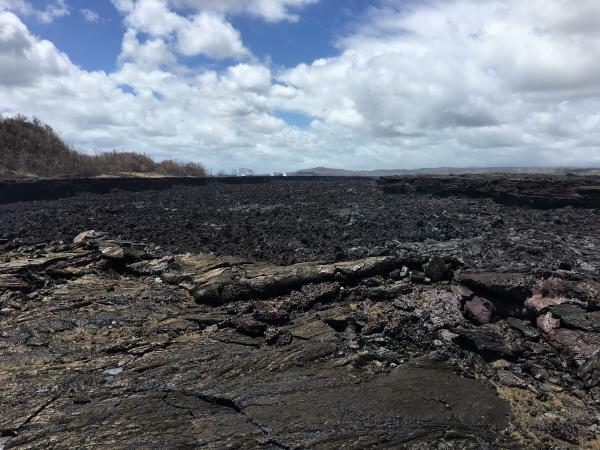 Now that #HurricaneLane is finally gone, #HVNPRecovery can continue. What happens after you reconnect a waterline that’s been broken for weeks? You got to flush it real good! And all the other Kilauea-related news. Also, for what it’s worth, there’s a Cat 4 Hurricane, Norman, heading towards the Central Pacific. Currently forecast to pass well NE of Hawai’i, but it’s a ways out and may have some impacts. That bitty island is back, by the way. Good clear views of the lava delta now that laze isn’t hiding it. 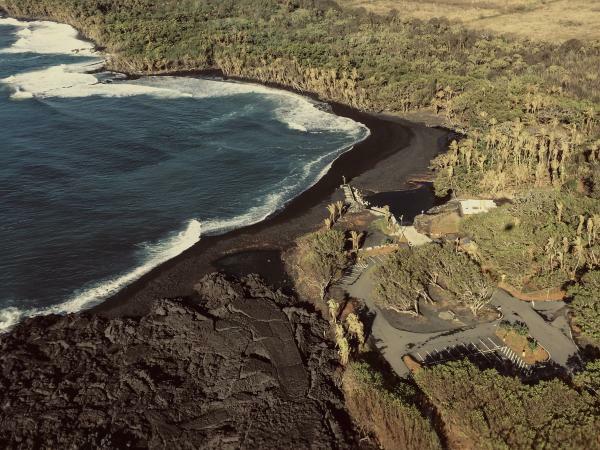 Wednesday, Aug 29, 2018, 6:00 am – Kilauea's lower east rift zone overflight: The growing new sandbar at Pohoiki has created a cool shore break, and has also trapped a few bodies of water. Wednesday, Aug 29, 2018, 6:00 am – Kilauea's lower east rift zone overflight: Rising steam along the edges of the perched channel accentuated the path of channelized flow toward the sea. Bruce also posted 9 photos and observations from a Saturday, Sep 1 evening overflight in which he observed some activity down in the Fissure 8 cone. Questions have dried to a trickle, along with the tin hat conspiracy theorists predicting dire things that didn’t come true. 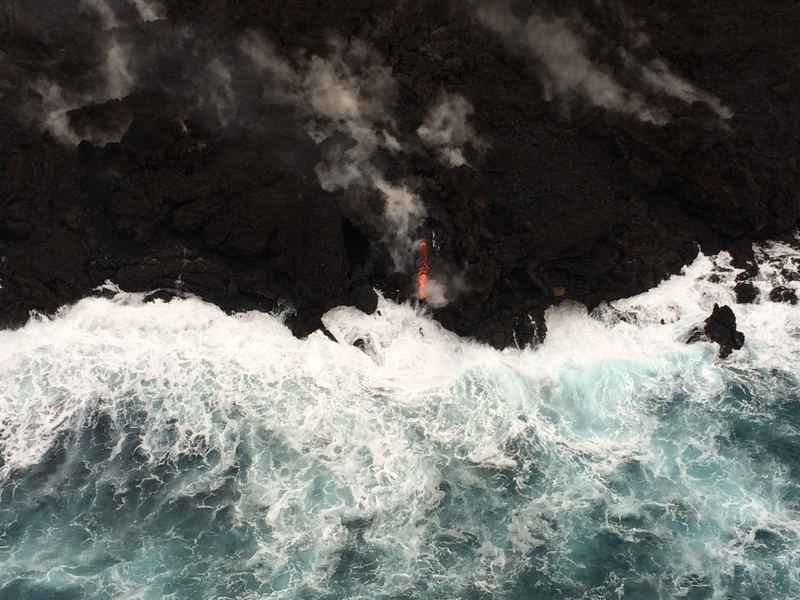 USGS: Assuming a one-story building is ~12 ft high, a 13-story office building would fit inside the fissure 8 cone. Q: What would you expect to see for a “closing” rift? At what rate would the intrusion cool? And how would it be noticeable? USGS: We are still monitoring crack temperatures and carefully watching for ground deformation trends in the lower East Rift Zone. The most recent deformation results in the LERZ do not show patterns that would be consistent with rift opening or closing. If the subsurface magma intrusion is cooling, those effects are not yet strong enough to be detectable. Neither do we see signs of inflation/reactivation. To answer your second question, cooling may take decades. 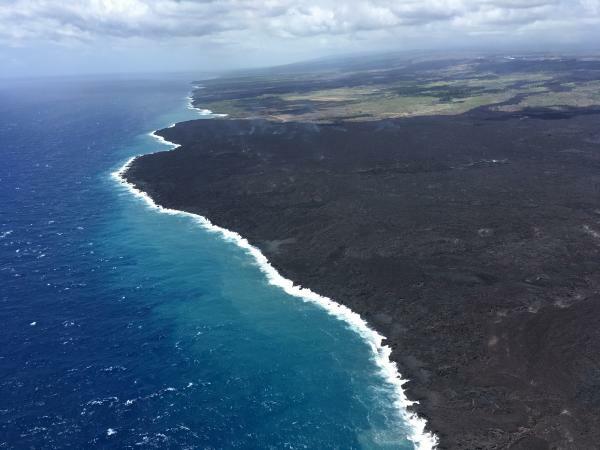 Some of the first lavas to erupt in LERZ were leftover from the 1955 eruption – the thick and viscous magma was reheated and pushed out ahead of new magma coming down the East Rift Zone. Q: Current SO2 rates? Signs of magma returning to summit? 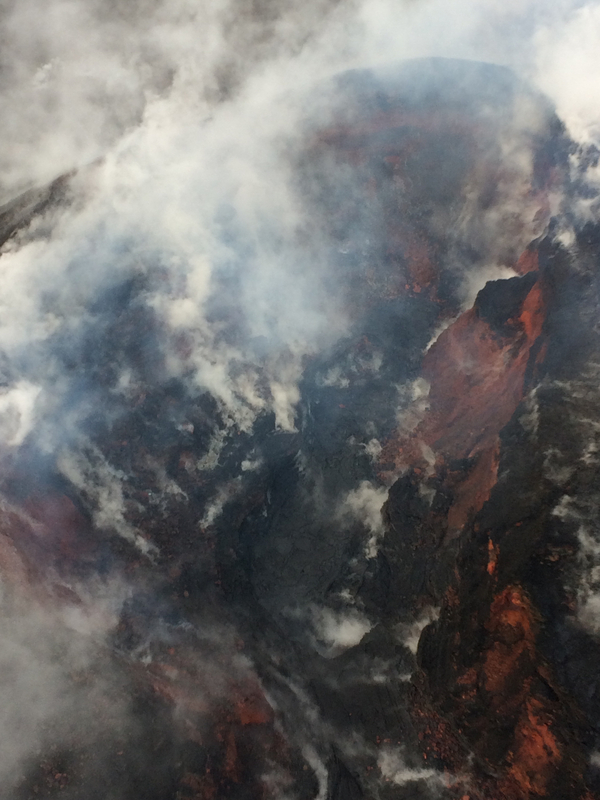 USGS: Sulfur dioxide emission rates at the summit, Puʻu ʻŌʻō, and lower East Rift Zone are all drastically reduced; the combined rate (< 1,000 t/d) is lower than at any time since late 2007. Seismicity, deformation and tilt at the summit are negligible. We continue to monitor for trends about what might happen next. Q (posted Aug 30): When do we call it pau? 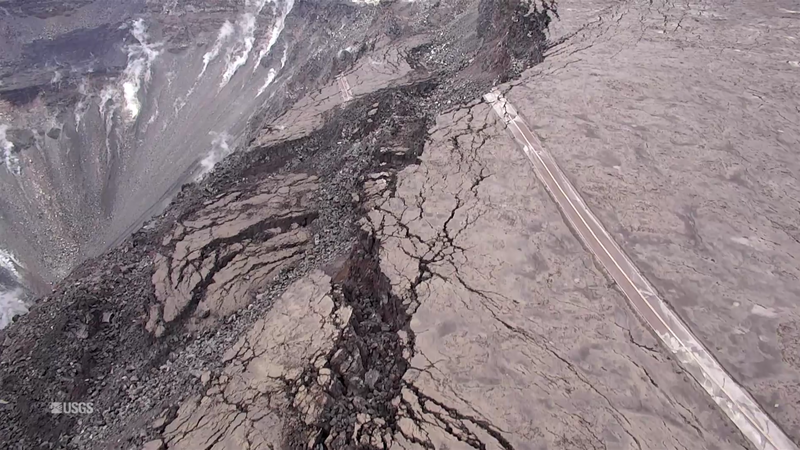 USGS: It’s possible that the slowdown reflects the end of the LERZ eruption and summit subsidence but we are going to hold off calling it pau at the moment. We’ve essentially flat-lined and are watching for trends now. Is the system going to repressurize? Continue to subside? We are tracking the subtle clues (gases, seismicity, ground deformation) that might give us an indication where we are headed. 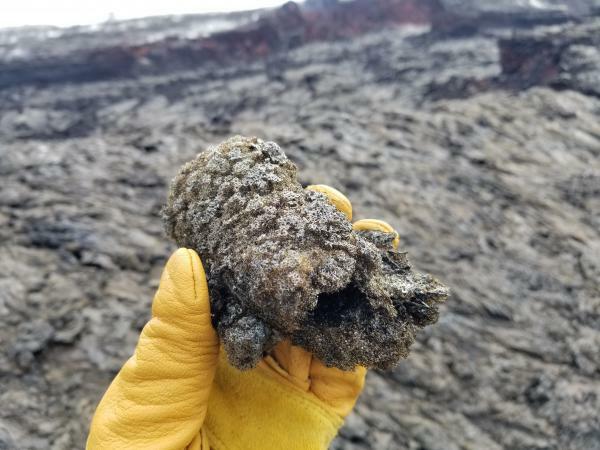 No ponding, but whiteout conditions were reported in the lower East Rift Zone's lava field due due to steam produced by heavy rainfall on still-hot (but not flowing) lava flows. At this point, probably around 100 feet or less. It's lost quite a bit of height to slumping into the crater. Depending on the thickness, it could be months or even years. 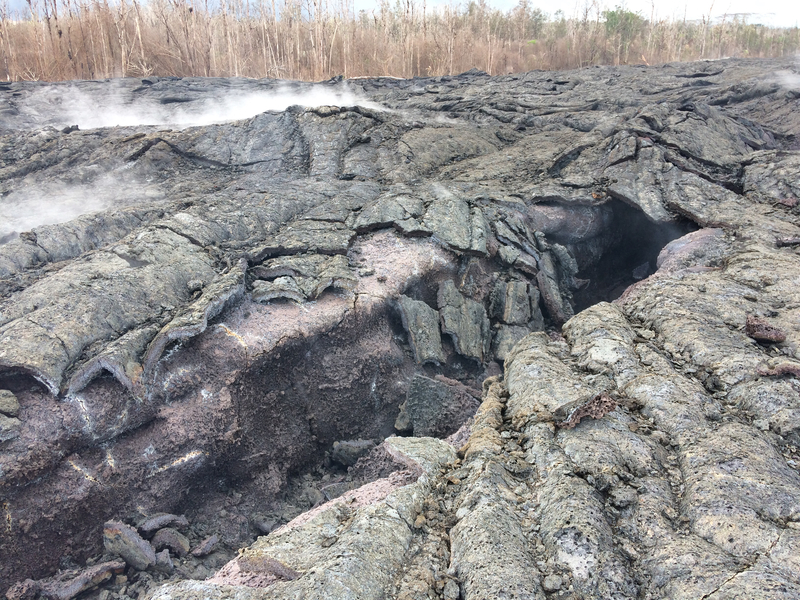 Lava is a very good insulator, so it can be cool enough to walk on within hours after erupting, but still hot inside for quite a while after. Those are tephra that oxidized (rusted) in the heat and steam from the fissure. It's pretty common in cinder cones, since it's so easy for gases to percolate through the loose deposits that make up the cone. The crater floor is at about the same depth as the water table. Prior to May, heat from the magma reservoir beneath the crater kept water away (it was heated to steam). It isn't clear if water can make its way back or if the magma reservoir repressurizes and a lava lake returns. Monitoring stations play a very important role now. Thus far, the seismic, GPS and tilt have essentially flat-lined. We are watching for trends in repressurization (none observed). Has supply diminished? In some places, the flows are probably thicker than 10 m (~33 feet). People retain ownership of their land even if it is covered in lava, although new land created offshore belongs to the state. Some rebuilding could be possible, but it's a fairly inhospitable environment. 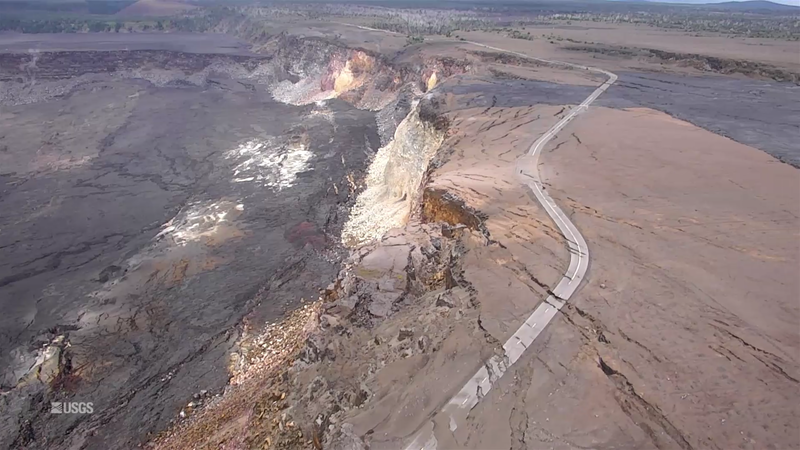 At this point #Kilauea and related tags are a wasteland as far as current information; scaremongers are posting several-month-old videos (some not even of Kilauea) as if it’s still happening.